In a perfect example of how small rural communities can rally around a common goal, the residents of Atlanta and Logan County came together to create a new exhibit for the Atlanta Museum. 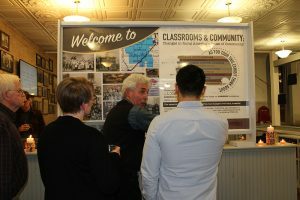 Bill Thomas, who donated the building housing the Atlanta Museum to the Atlanta Public Library District, leads visitors into the “Classrooms & Community” exhibit. 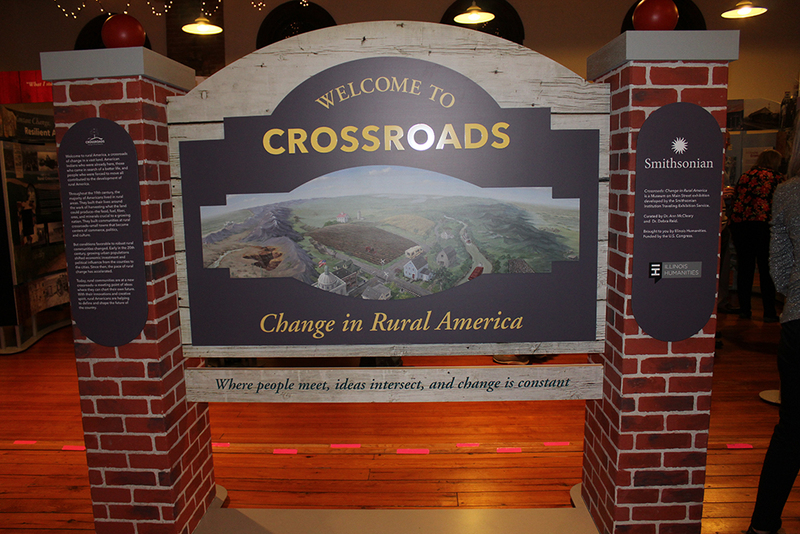 Called “Classrooms & Community: Changes in Rural America’s Sense of Community,” the local exhibit is a companion to the traveling Smithsonian Institution’s Museum on Main Street “Crossroads: Change in Rural America” which opened on Feb. 2, 2019 at the Atlanta Museum. 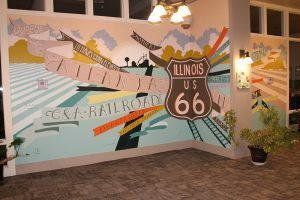 Illinois Prairie Community Foundation awarded the Atlanta Public Library District, which also includes the museum, with a $2,000 grant to partially fund the exhibition. “It definitely has taken a village to create this exhibit,” said Atlanta Public Library Director Cathy Maciariello at a private preview event on Feb. 1. Maciariello thanked the many people who gave their time and talents to the project by donating pieces to the exhibit, building display cases, conducting oral interviews and creating signage. View photos from private preview event . Atlanta Museum Director Rachel Neisler worked with the Illinois Humanities council to design the “Classroom” exhibit which explores the relationship between school and community through three different lenses: rural one-room schools, Atlanta community school district and Olympia School District consolidating schools from eight communities. Neisler and a group of volunteers traveled to Shelbyville to pick up the Smithsonian exhibit in 15 “gigantic” cases and transport it to Atlanta where they assembled it in the museum located in Union Hall in downtown Atlanta. The “Classroom” exhibit was the big hit of the private preview. 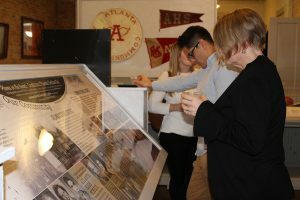 Visitors lingered among the displays of photos and stories of students past and present, school emblems, desks, band and cheerleader uniforms, letter jackets and lockers. Excited cries of “I remember her” and “Look at that!” could be heard as visitors rediscovered their past. An interactive exhibit of a blackboard asking visitors “Where did you attend school?” had tallies under all three categories of Rural School, Atlanta School and Olympia with a majority identifying as attending at Atlanta School. The “Crossroads” exhibit offers small towns a chance to look at their own paths to highlight the changes that affected their fortunes over the past century. The exhibition aims to foster discussion about what happened when America’s rural population became a minority of the country’s population and the ripple effects that occurred. Themes focused on Identity, Land, Community, Persistence and Managing Change. The timing of the Smithsonian exhibit’s appearance in Illinois is special because Illinois just celebrated the bicentennial of its statehood (Dec. 3, 1818) and rural history is so important to state history, said Matt Meacham, Illinois Humanities Project Manager. “This explores how the story of Atlanta and Logan County fit into the history of rural America,” he explained. “Crossroads” brought up many memories for Susan Hoblit who grew up on a farm near Atlanta, attended Atlanta High School and still lives in Atlanta. “I like the quiet of country life,” she said. Hoblit is on the board of the Atlanta Betterment Fund, which also sponsored the exhibit. 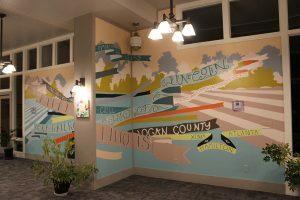 Also unveiled at the private preview was a mural created by Regan King of Bloomington. “Prairie Pathways” illustrates an intersection of the many travel ways that define historic Atlanta. Central to the piece is a Route 66 road sign, with ribbons and text stretching out over a prairie landscape. “Crossroads” will only be available in Atlanta through March 16, but “Classroom” will become a permanent exhibit at the Atlanta Museum. The exhibition is open from 10 a.m. to 3 p.m. on Thursdays, Fridays and Saturdays, noon to 3 p.m. on Sundays, and by appointment. 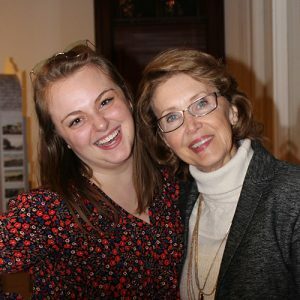 If you would like to help fund more programs like this in the community, please donate to the IPCF Arts and Culture Endowment which helps fund Mirza/Arts & Culture Grants.